Enormous wit, tremendous bravery, and a gargantuan nose. Cyrano is passionately in love with the glorious Roxanne, but believes that she could never love him as he is. He creates poetry to woo his great love on behalf of the beautiful Christian, whom Roxanne imagines she loves. After years of mourning, Cyrano finally learns the answer to the question he could never ask. The cast of CYRANO DE BERGERAC. Photo by LINDSEY WALTERS. 2014. 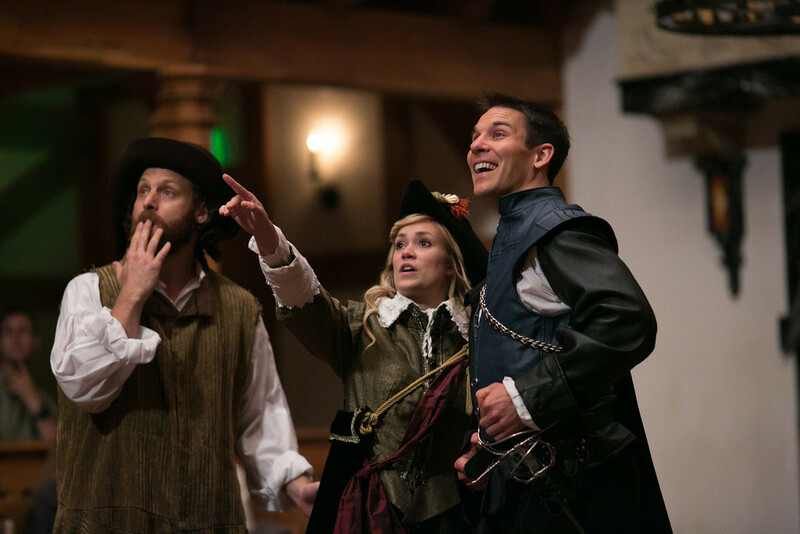 Jonathan Holtzman, Lauren Ballard, and Patrick Midgley in CYRANO DE BERGERAC. Photo by LINDSEY WALTERS. 2014. John Harrell in CYRANO DE BERGERAC. Photo by LINDSEY WALTERS. 2014. 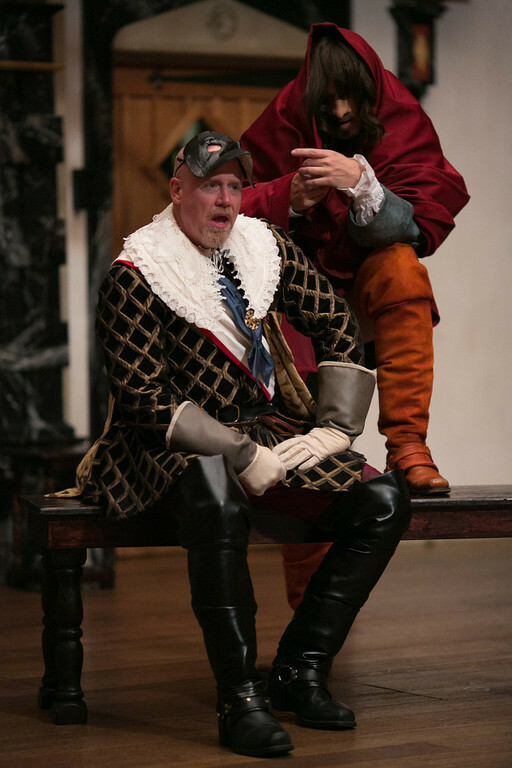 John Harrell and Chris Johnston in CYRANO DE BERGERAC. Photo by LINDSEY WALTERS. 2014. 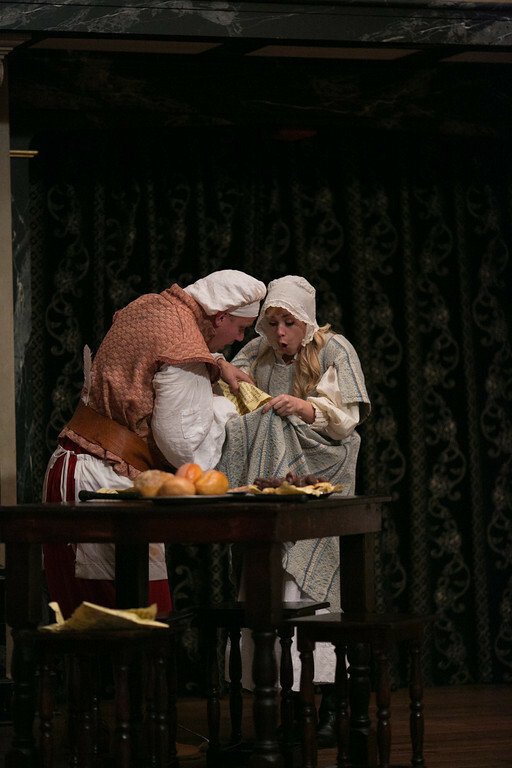 Benjamin Reed and Lauren Ballard in CYRANO DE BERGERAC. Photo by LINDSEY WALTERS. 2014. 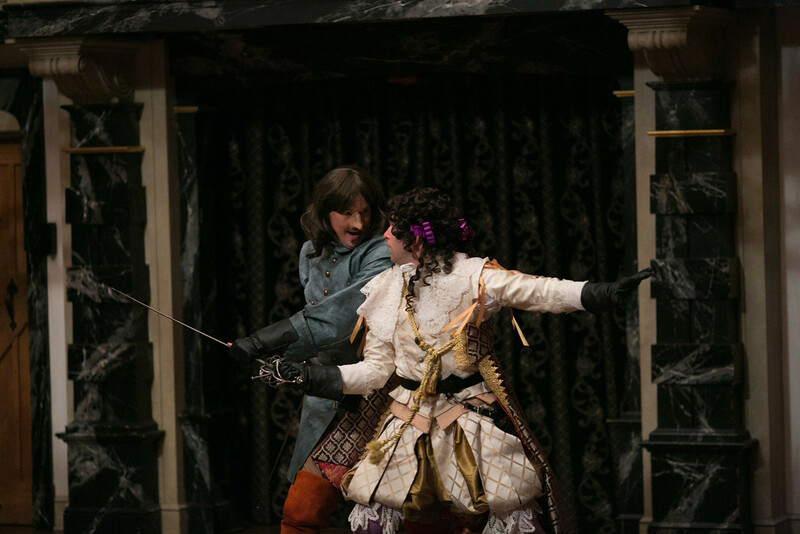 Sara Hymes and John Harrell in CYRANO DE BERGERAC. Photo by LINDSEY WALTERS. 2014. 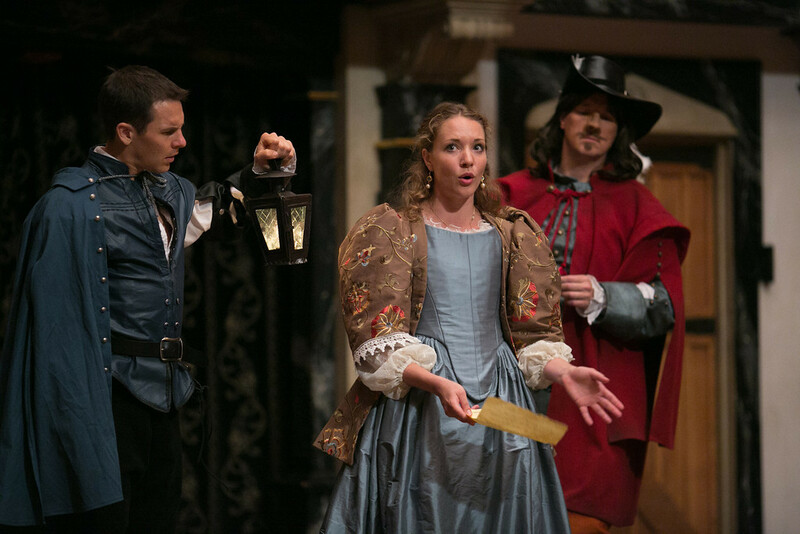 Patrick Midgley, Sara Hymes, and John Harrell in CYRANO DE BERGERAC. Photo by LINDSEY WALTERS. 2014. James Keegan and John Harrell in CYRANO DE BERGERAC. Photo by LINDSEY WALTERS. 2014. John Harrell and Sara Hymes in CYRANO DE BERGERAC. Photo by LINDSEY WALTERS. 2014. Christian, a new member of the Royal Guard, arrives at a theatre in Paris, where a drunken poet, Lignière, tells him the name of the woman with whom he has fallen in love from afar is Roxane. He also discovers that a married nobleman, De Guiche, wants to make Valvert marry Roxane so that he may keep her as his mistress. Cyrano de Bergerac interrupts the performance at the theatre; Valvert picks a fight with him. Cyrano composes a poem during their duel. Cyrano confesses his love for Roxane to his friend Le Bret. Roxane’s chaperone sets up a meeting between Cyrano and Roxane for the next day. Cyrano discovers that a hundred men plan to kill his friend Lignière because of a song he wrote. Cyrano composes a love letter to give to Roxane; before he gives it to her, she tells him that she is in love with Christian. She asks Cyrano to befriend and protect Christian as a new member of the Royal Guard. Cyrano promises to do it. The Royal Guard arrives to celebrate Cyrano’s exploits with the one hundred assassins. 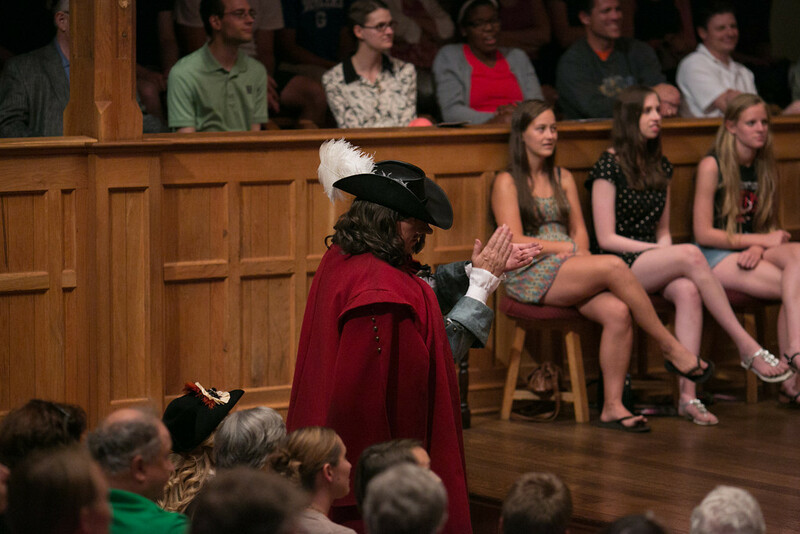 De Guiche offers to help Cyrano court the favor of the powerful Cardinal Richilieu; Cyrano declines. 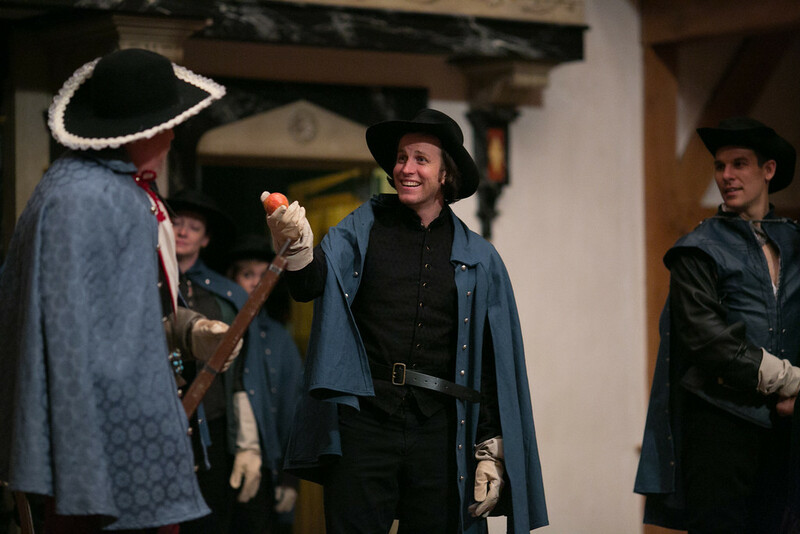 The Guard trick Christian into mocking Cyrano’s nose; instead of demanding a duel, Cyrano asks to speak with Christian alone. Cyrano tells Christian of Roxane’s love for him and that she expects a letter.  De Guiche plots to have Roxane spend the night with him before he leaves for war. Christian tires “of borrowing lines” and believes he’s ready to woo Roxane without help from Cyrano. He fails, she goes inside. Christian allows Cyrano to feed him words to say to Roxane on her balcony; but when Christian cannot repeat the words quickly enough, Cyrano begins speaking them himself, poetically professing his love to Roxane, pretending to be Christian, hidden by the night. Because of Cyrano’s wooing, Roxane’s heart is won and Christian goes inside to collect a kiss. Cyrano delays De Guiche, allowing Roxane and Christian to be married. Upon discovering the marriage, he orders Christian and Cyrano’s regiment to the front line of the war with Spain. De Guiche announces that the battle plan now includes the Royal Guard laying down their lives. Battles, losses, and one last letter ensue. 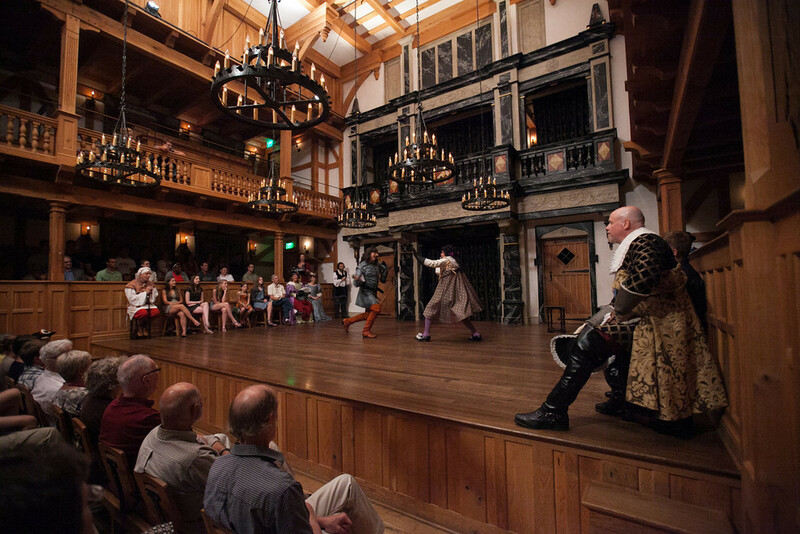 plays that help us create remarkable art using Shakespeare’s Staging Conditions. Cyrano de Bergerac fits those criteria. 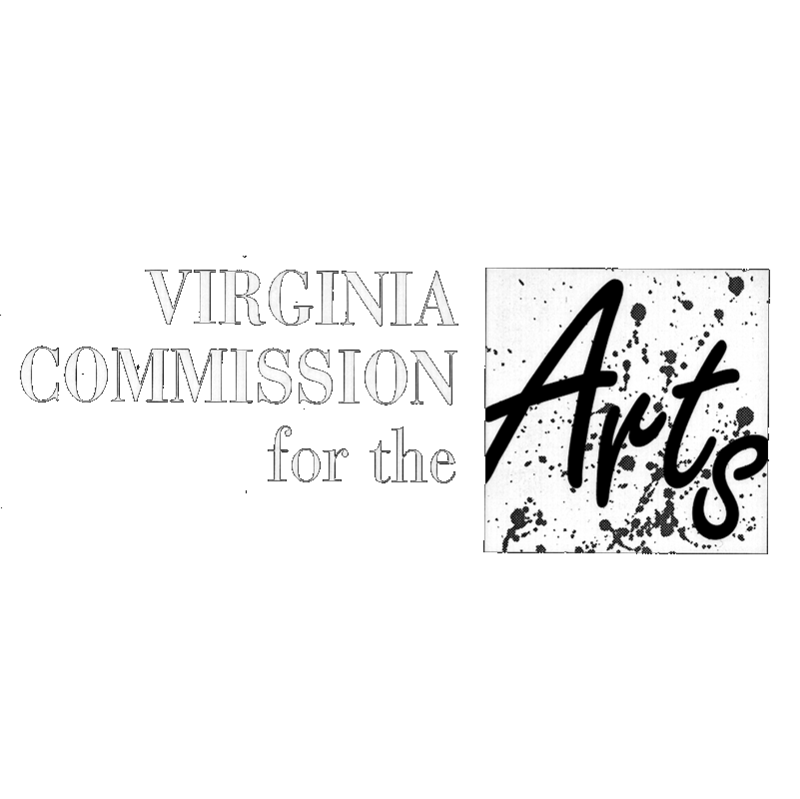 It’s a play that’s been done by nearly every major classical theatre company in the world. And one of the joys of this company producing it is that the play’s first scene takes place in 1640 inside a Paris theatre which has a visible audience interacting with each other and the performers very much like our own Blackfriars Playhouse. As Burgess himself has pointed out, critics of the play might complain about its “bald contrivances, the psychological implausibilities, and the gross sentimentality of the ending.” But those critics probably don’t like Romeo and Juliet or A Midsummer Night’s Dream either. The biggest surprise for me the first time I directed Cyrano was how moved I was by this “sentimental” love story and how timeless the relationships are. If we haven’t actually been the “ugly duckling” with a secret love or the “attractive couple” who “ought to be” perfect for one another, then we’ve probably been one of their friends or known people in those situations. It’s a big play with a big heart that takes no prisoners as it embodies and dissects big love. Centuries after Shakespeare and the real Cyrano lived, over a hundred years since Rostand first penned his play, our twenty-first century planet needs love this big. Right here. Right now. One of the many diseases we have when we’re young is that we think we’re going to live forever and that we’ve got all the time in the world to do/say/be the things we really want and need. The reality is that we’re not going to live forever and we don’t have all the time in the world. Your life is now. Make it big, make it count.